The PureLink Media Axis MA-62M with built-in iCON automation is the “control freak” of mobile switchers, featuring a ruggedized chassis for high-traffic environments and state-of-the-art performance with all-in-one functionality. The Media Axis brings real-world flexibility to any environment. Designed with six HDMI 1.4b inputs and four TotalWire Cat-6 inputs (PureLink’s proprietary transmission system featuring HDB aseT technology), the MA-62M enables seamless switching, scaling, and extension of control and audio/video signals up to 4K resolution formats. The MA-62M also powerfully converges IT with AV applications, receiving web-based remote control via any Windows or Mac platform, such as a PC, laptop, tablet, or smartphone. The MA-62M also offers advanced audio processing, with multiband EQs, compressors, and more, along with iCON , PureLink’s innovative automation platform that enables control of third-party devices such as projectors, screens, lights, and more, simplifying system operation. The Yamaha CL Series of digital consoles raised the bar in live digital mixing with evolved sound quality, operability, and functionality, while maintaining the traditional values that have made Yamaha digital mixers industry standards. 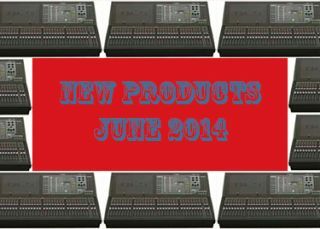 Yamaha Commercial Audio Systems will show the new QL Series digital audio console at InfoComm 2014. The new console inherits CL features like all-in-one mixing, processing, and routing capability for small to medium scale live tour sound, houses of worship installations, corporate AV, and speech applications. As with the CL Series, the Yamaha QL Series includes circuitry and components that have been designed and selected with care, achieving audio purity from input to output. With a solid, sonic foundation it is possible to take full advantage of built-in premium internal processors, such as Yamaha VCM technology and the Portico 5033/5043 created in cooperation with Rupert Neve Designs to shape and create as required. For a wide range of speech applications, built-in Dan Dugan Sound Design automatic mixing provides optimum channel balance while allowing the mix engineer to concentrate fully on the overall sound. The Crestron FT-TSC600 FlipTop touchscreen control system provides a configurable control and connectivity solution in a stylish black anodized or brushed aluminum flush mount tabletop design. It features a built-in 3-Series control processor, brilliant five-inch color touchscreen with Smart Graphics, Rava, and H.264 streaming video that combine to deliver a complete, space-saving controller for any small conference room or similar space. The built-in connection compartment keeps interface cables and connectors at the ready for plugging in laptop computers, mobile devices, AV sources, and other equipment. New universal cutout size fits all new and future FlipTops. A FlipTop touchscreen control system is an ideal complement to a DigitalMedia system or any other AV system. It provides an intuitive and inviting “front end” for the more complex and mundane technology beneath the tabletop and throughout the room. The integrated touchscreen and control processor can provide total control for an entire room, offering a fully-customizable user interface for selecting presentation sources, adjusting audio levels, dimming the lights, and even calling for lunch service. Advanced capabilities include displaying full-motion video and hands-free audio conferencing. The ATEM 2 M/E Production Studio 4K from Blackmagic Design includes 20 independent SD, HD, or ultra HD 4K video inputs with each input featuring a full frame synchronizer. ATEM 2 M/E Production Studio 4K also includes chroma key, transitions, DV E, media pool, downstream keyers, audio mixer, two multi-view outputs and 6G-SDI and HDMI 4K video connections. This new highend model of the ATEM Production Studio family includes all the powerful features of the other models, as well as the SuperSource multi layer processor. SuperSource provides customers with a completely separate five-layer switcher with four picture in picture DV Es and four keyers assigned to any ATEM video input. SuperSource allows for multi camera interviews or picture in picture production while leaving all M/Es, keyers, and the DV E completely free for other tasks. ATEM 2 M/E Production Studio 4K supports 6G-SDI, so it can be switched between most SD, HD, and ultra HD video formats instantly. There is also a high definition down converted HD-SDI program output for when the switcher is operating in ultra HD formats, but a regular HD program feed is required. Video Mount Products FP-XMLPAB “extra medium” low profile articulating wall mount with tilt and list adjustment capabilities holds most 32- to 52-inch flat panels up to 100 lbs. The FP-XMLPAB also includes an integrated cable management system, an integrated level, 600mm x 400mm maximum flat panel hole pattern, and comes in a black powder coat finish. ClearOne VIEW Pro HD encoders and decoders provide high-profile, 4:4:4 multimedia streaming with lossless compression. Content can be distributed via IP to virtually an unlimited number of displays, and VI EW Pro is compatible with ClearOne’s StreamNet technology for auto discovery and control of all networked StreamNet products. ClearOne’s VI EW is differentiated in the market by providing a complete AV distribution solution that can scale to any project size, from light commercial to stadium. VIEW AV encoders, decoders, amplifiers, and ethernet switches provide complete flexibility and scalability of networked audio and video, perfect for corporate communications, hospitality and entertainment, education, healthcare, houses of worship, and digital signage. The included VIEW Virtual Matrix Software displays a simple view of the entire system on a single screen, as well as providing simple source and destination selection and control options in Windows, Android and iOS for StreamNet encoders and decoders. Users have control access from any number of input devices, including wall touchscreens, desktops, laptops, and handheld devices. Peavey Architectural Acoustics is now shipping its latest advancement in pro audio loudspeaker enclosures, the Elements weatherproof loudspeakers. The all-new American-made, durable, reliable and versatile Elements weatherproof enclosures are a combination of innovative cabinet construction and weatherized components designed for direct contact with the elements in the most demanding climates. The Elements C series of composite enclosures are constructed from an advanced composite fiberboard material that is dimensionally stable in wet conditions and resists contamination, yet has the resonant properties of wood. This light and durable material ensures sonic performance while providing reliable service year after year. The aluminum grilles of the Elements C series enclosures feature a barrier membrane that repels water, yet allows moisture to escape without affecting the sonic performance of the loudspeaker. BTX Technologies has released a Mersive approved appliance solution for Solstice collaboration software. This solution comes with everything needed to make a boardroom or classroom collaboration ready. Solstice enables multiple presenters to connect simultaneously to a shared display using a range of devices over an existing Wi-Fi or Ethernet network. With a Solstice-enabled display in a meeting room, any number of presenters can instantly connect, share and control the display, fostering collaboration and decision-making. In addition, enterprise customers can use the Solstice Dashboard to centrally manage all of their Solstice displays across their corporate network. Two versions of the BTX Solstice Appliance for collaboration are available - one for unlimited presenters and one for up to four presenters, and each come with an option for an extended software maintenance period. The hardware is the same in each solution, allowing an easy upgrade from Solstice SGE to Solstice Unlimited if room requirements change. The appliance solution includes a windows operating system, keyboard, mouse, power supply and the Solstice by Mersive software. Tempest, a manufacturer of climate controlled projector enclosures, is showcasing its noise attenuating range, HUSH, at InfoComm. The HUSH range reduces the audible noise from even the largest format projectors to as little as 2dB. This makes them suited to theaters, lecture halls, boardrooms, and houses of worship. InfoComm attendees visiting Tempest will find the HUSH lineup facilitates a wider-range of projector installations, providing them a unique opportunity to service a much wider audience. This will allow for bigger, higher quality projectors to be installed in areas that were previously out of bounds, with increased profit margins for installers. Tempest’s HUSH enclosures are lined with acoustic insulation material and feature airtight seals to keep projector noise safely inside. The smaller Blizzard HUSH enclosures (3-15,000 ANSI Lumens) come with a powerful exhaust fan at the end of a 25ft/8m padded hose that allows them to be installed into a ceiling void or in an adjoining room. For projectors up to 40,000 ANSI Lumens, the Cyclone HUSH enclosures use a duct to connect to fans located safely out of earshot. NEC Display Solutions of America is introducing the latest addition to its PA Projector Series, the PA622U. The PA622U, ideal for corporate, higher education, and museum application, is the first projector in the NEC lineup to include an HDBaseT connection. HDBaseT reduces the cost and time of installations by simplifying the install process. HDBaseT supports uncompressed full HD digital video, audio, and control over a single Cat-6 cable. The 6,200-lumen projector offers stacking capability, which allows up to four projectors to be stacked vertically or horizontally to boost image brightness up to 24,800 lumens, an asset for larger-sized screens and environments with additional ambient light. NEC’s PA622U projector incorporates tilt-free installation capabilities, allowing for floor or ceiling projection. Built-in edge blending delivers seamless high-resolution images of almost any configuration and the addition of portrait mode provides new projection configurations and dynamic atmospheres. A key highlight at Drake’s InfoComm booth will be the DSE 2 PLUS dual multiplexing encoder, which combines encoding and QAM modulation capabilities within a single stand-alone unit. Ideal for digital signage applications, the DSE 2 PLUS can also be used to simplify HD video distribution for various applications across the house of worship, education, healthcare, government, and hospitality markets. The DSE 2 PLUS digitally encodes two uncompressed HDMI, high-resolution component video or VGA inputs to MP EG-2 or MP EG-4 (H.264), and then uses an internal multiplexing QAM modulator and low-noise upconverter to enable distribution of two HD programs over existing legacy fiber and coaxial networks while providing reliability and consistent performance. Leveraging the bandwidth savings provided by the encoder, users can deliver twice as many HD programs or multiple channels at half the bandwidth. This enables users to tap into existing networks of digital HD displays to provide informational video, revenue-generating advertising, or promotional content in a vibrant high-definition format. Making its Americas debut, the Kramer VP -794 universal live events scalers will be demonstrated in typical live events scenarios. Creating an engaging and bright display that’s expected to be seen from all angles of the InfoComm show floor, the VP -794 will drive content for display on to Lighthouse Technologies’ LED video walls. Complementing this will be a demonstration of the VP -794’s capabilities to edge blend and warp various content onto a curved screen display using ultra-bright large-venue projectors from Digital Projection International. The HuddleVU collaboration system allows for multiple users to share and view their laptops, tablets, and smartphone screens on a main display. Unlike conventional presentation systems, anyone participating can be a presenter or an audience member at any given time at the push of a button. LED’s indicate which user is currently live and when the system is busy. Available in three model styles, HuddleVU ’s first is the HV-1000 single table box system that employs a single FSR HV-T6 table box that allows one to four users to plug in and power their laptops or other input devices and simply push a button to display their desktop information on the main display. Any user can switch to their own laptops, tablets, and smartphones at any time simply by pushing their own button on the T6 housing. The second HuddleVU model, the individual HV system, can accommodate anywhere from three to seven users. The third model—the HuddleVu Flex—is the standard HuddleVu HV-1000 with an embedded touchscreen control in the top of the T6. The robust Flex system allows for control of projectors, screens, shades, mics, or almost any complimentary equipment in the room. An HV-CTL controller and up to two DV-HSW-41 HDMI switchers are included on all systems. The HV-CTL has a power switch, two AC outlets to power the DV-HSW-41 HDMI switchers and an additional AC outlet to power the main display. The HVCTL is the main termination point for the system components. When four or less inputs are used the HV-CTL switching can be serially controlled by an external control system. Listen Technologies announced its new Stationary RF systems designed as a solution for system integrators, contractors, and consultants working with venues seeking assistive listening for either legislative compliance or to meet the personal listening needs of their customers. The new systems are available in a range of configurations, offer a competitive price point to installers and high quality sound (with 20dB less hiss than competitive products from other brands), and are backed by an extensive warranty and Listen Technologies’ customer service/support. All systems include all necessary components for assistive listening and legislative compliance. An SQ Super Quiet Companding Switch provides the highest audio quality available when enabled. SQ can be disabled for compatibility with other assistive listening equipment. There are 57 channels offering maximum flexibility, with capabilities for language interpretation and assurance in finding a clear channel. The Look & Listen display on select receivers allows for intuitive use, managing, and programming. The RC3X-E4P is SCT’s latest RemoteCam3 solution addressing the need to remote the Polycom EagleEye IV camera from a Polycom Group System codec. Utilizing dual Cat-5e or Cat-6 cables, the RC3X-E4P extends power, control, IR , and 1080p video up to 300 feet between codec and camera. The kit is inclusive of a power supply for the headend/ codec module, HDCI codec cable, RC3X-HE head-end module, RC3X-CE camera module and Mini-HDCI camera cable and “sniffer” to confirm termination on the power cable. The RC3X-CE camera module integrates with SCT’s RC3-EE4 dual gang camera wall mount. Apantac is launching an HDMI Clean Switch at InfoComm 2014.As the newest member of the MT HOOD series, the HDMI Clean Switch (Model: CLN -SW-6x1-H) is a versatile and cost-effective 6x1 clean switch that seamlessly switches between HDMI sources. It can eliminate the normal frustrations associated with switching between multiple HDMI sources. The built-in clean switch technology ensures that the user will not experience any screen glitches or random noise pops during the switching process. Key features of the CLN -SW-6x1-H HDMI Clean Switch include: Up/down/cross conversion for HDMI input and output; de-interlacing (interlace to progressive conversion); maximum output resolution of 1080P 60Hz; seven predefined presets (one full screen, four PIP , two PBP modes); built-in audio delay up to 70 ms; eight predefined output resolutions (640x480 to 1920x1080); ethernet, RS232 control; IR remote control; and EDID management. ESP/SurgeX is bringing the Defender Series MultiPak, a multi-stage surge protector and power conditioner specifically designed to safeguard digital signage arrays, to InfoComm 2014. Available in four (SX-DS-154) and six (SX-DS-156) outlet configurations, the MultiPak provides advanced protection against damaging surges, spikes, over/under voltage, EMI /RFI noise, wiring faults, and other power issues that can degrade video display performance. The unit’s compact design fits behind multi-panel installations and easily integrates with wall and ceiling mount systems. Developed in direct response to the challenges encountered by digital signage manufacturers, the MultiPak was engineered to keep digital displays running properly without interruption. Digital display systems rely heavily on sensitive integrated circuitry for optimal performance. Liberty AV Solutions announced the the latest Intelix switching scaler product, DI GI-P52. This device is designed to add video switching, scaling, and audio processing to classrooms, training rooms, and meeting areas, especially where under table installation is desired. The new DI GI-P52 is a multi-format switching scaler with three HDMI and two VGA video inputs. This switcher scaler provides microphone and line level mixing, plus analog audio embedding, and analog line level output. The DI GI-P52 features simultaneous HDMI and HDBaseT outputs that are scaled to one of seven output resolutions: 1024x768, 1280x720 (720p), 1280x800, 1360x768, 1600x1200, 1920x1080 (1080p), and 1920x1200. The HDBaseT output of the DI GI-P52 provides power to a remote HDBaseT receiver, such as the DI GI-HD60C-R, with the option to control the DI GI-P52 from the remote location. The DI GI-P52 features a convenient autoswitching feature to automatically switch between HDMI and VGA sources. Additional control options for the new digital presenter include front panel push buttons, IR, TCP/IP, and RS232. Using integrated CEC commands, HDMI sources with CEC enabled can be controlled through the DI GI-P52 via IR, TCP/IP, or RS232. When connected to an internal network, the DI GI-P52 can be accessed via a web browser for system control. Harman’s Crown Audio is expanding its DriveCore Install (DCi) Series amplifier range with the introduction of its DCi Network Display 8|600ND and 4|1250ND power amplifiers, featuring front-panel status displays and AVB connectivity. Both DCi Network Display amplifiers feature a front-panel display and LED indicators that provide at-a-glance indication of key parameters. A large multifunction knob and push buttons enable instant access to control functions. The amplifiers are compatible with Harman’s HiQnet Audio Architect system setup and control software and utilize TCP/IP -based protocol in HiQnet for network monitoring and control. The eight-channel DCi 8|600ND delivers 600W into 8 ohms (300, 600 and 300W into 16, 4 and 2 ohms) and the four-channel DCi 4|1250ND provides 1,250W into 8, 4, or 2 ohms (625W into 16 ohms). Both amplifiers offer direct drive “constant voltage” capabilities for 70Vrms and 100Vrms amplification without the need for a step-up transformer, yielding higher audio quality in distributed audio applications with power outputs of 1,250W and 600W respectively. Both amplifiers provide a host of networking and control features to ensure reliable operation, including continuous load monitoring, comprehensive error reporting, pilot tone monitoring and programmable general purpose input/output (GPIO ) ports. The DCi 8|600ND and DCi 4|1250ND offer extensive DSP capabilities, such as LevelMAX limiters for the inputs and outputs, with thermal limiting, input and output delay, input and output EQ, built-in crossovers and a built-in signal generator. Stealth Acoustics’ SA2400 dual-channel amplifier with built-in DSP provides maximum ease and flexibility of powering and tuning Stealth speakers or other speaker systems. Rated at 450W RM S per channel, the SA2400 utilizes Stealth’s Class A/B output stages coupled to a traditional high-current power supply for professional output and long -term reliability. The SA2400 also debuts the newly designed Stealth Signal Management System (SSMS) that allows for complete per-channel programming of advanced DSP features including 11 bands of fully parametric EQ; high and low pass filters with variable slopes; fully programmable limiters; delay; phase control and pink noise generators. All SSMS functions may be programmed from the front panel, or by using Stealth’s free SSMS software via USB connection to the amplifier. The SSMS includes loadable pre-set optimization tunings for many of Stealth invisible and environmental speakers. A full complement of inputs include balanced XLR, un-balanced RCA and Speaker Level connections, all which have associated pass-through connectors. An optical input is included for easy integration with digital audio sources. Analog Way is introducing full 4K resolution on the LiveCore series of Premium AV Switchers. With the new 4K technology, it offers the latest generation of HDTV standards (UHD and DCI 4K). Additionally, Analog Way brings a significant improvement to the LiveCore series of AV processors with the addition of new connectors: HDMI 4K and DVI 4K. Three HDMI 4K inputs and 2 x DVI 4K outputs will be available on the SmartMatriX Ultra, Ascender 32, and Ascender 48. The NeXtage 16 will come with 2 x HDMI 4K inputs and 1 x DVI 4K output. Several frame rates are available as 4K/30P 4:4:4, 4K/60P 4:2:0 or 4K/60P 4:4:4 according to the reference. The LiveCore series supports 3840x2160 (UHD) and 4096x2160 resolutions (native resolution for DCI-compliant 4K). The powerful processing capabilities of the LiveCore series allows managing different 4K display combinations without losing the use of true seamless layers. To ensure optimum efficiency, the LiveCore series offers the ability to perfectly switch a 4K native background or 4K layers. In a move to provide AV integrators with display solutions that offer unmatched strength, mounting flexibility, aesthetics and user friendliness, Middle Atlantic is introducing the FlexView Series at InfoComm 2014. A collection of display stands and carts ideal for corporate, hospitality and education environments, FlexView models feature a slim profile, contemporary design aesthetic and safety certification, offering hallmark Middle Atlantic strength and durability. FlexView solutions feature the lowest profile display mount in the industry, as well as a smaller base for unimpeded, up close display interaction. In addition, it enables mounting of larger displays than competitively-priced solutions currently available in the market, including most 90-inch screens with VESA 800 mounting or smaller. Models are available with electric or manual display height adjustment for options in ergonomics and flexibility. FlexView solutions are also available in stationary or mobile configurations with rugged casters that provide long-lasting use and seamless maneuverability, even when wheeling over door thresholds. Underscoring its commitment to meet the increasingly complex and challenging power conditioning needs of audio, video and broadcast professionals, Core Brands introduced the Furman P-8 PRO C Power Conditioner. This Classic Series 20Amp power conditioner delivers protection, performance and exclusive Furman technologies, such as series Multi-Stage Protection (SMP) and Linear Filtering Technology (LiFT). Featuring a rugged 1-RU chassis with a minimalistic front panel, the P-8 PRO C is ideal for power conditioning applications where front panel metering and illumination are not required. The P-8 PRO C provides users with Furman’s SMP surge protection circuit. The technology’s ability to safely absorb, clamp and dissipate transient voltages virtually eliminates service calls. The device’s over-voltage circuitry (EVS) protects against accidental connections to 208 or 240 VAC by shutting off incoming power until over-voltage is completely corrected. Intended for commercial AV installations, this insert card extends and converts DVI , VGA, and Component video, along with stereo analog audio and USB-HID KVM for remote keyboard mouse applications, over a single fiber. It allows for two choices of optics, the original 4.25 Gbps optics that supports Component video up to 1920x1200/60Hz for digital signage and 1600x1200/60Hz for PC graphics, for distances up to 25 km (15.5 miles), and using the newest 10.3 Gbps optics for signals up to 4K UHD (3840x2160) for distances up to 10 km (6.2 miles). Emcore’s OTP-1DVI 2A1UKM is compatible with all of the Optiva fiber cards; all managed by the same OptivaView SNMP and Controller Card for monitoring the health of each remote card. The Optiva platform is unique because of its daisy-chain capabilities, using time-division multiplexing, which allows a full rack of almost any configuration to be sent over a single fiber cable, as well as allows for a growing network of channel requirements on an as-needed basis, keeping costs low. Management and control of the Optiva system can be accomplished securely from a remote location miles away from the network. IHSE USA is introducing a new family of fiber/Cat-x media converters and cross-repeaters. The new 485 series were specifically designed for applications requiring cross conversion of Cat-x to fiber, repeating Cat-x or fiber interconnects for longer distances, or connecting redundant path operations for zero down-time operations. These media converters/repeaters can be used with IHSE USA’s vario, compact, and enterprise line of switch products. The 485 series is the perfect cost savings solution when only a few signals need to be shared longer distances between buildings or multi-level office buildings. Signals available on a cat x matrix switch system can be converted to fiber for transmission and converted back to Cat-x at the receiver (or viceversa). This is useful in bridging buildings with copper-based switch/ extender systems that are located some distance apart. High-quality signal processing and integral amplification ensures no signal degradation or transmission artifacts. These devices can be deployed between extenders as point-to-point or between extenders and matrices. For instance, IHSE USA’s Cat-x matrix systems can easily be retrofitted to support longer run fiber requirements by adding a set of 485 CAT-x to fiber media converters. For critical path operations, the 485 series is offered with a redundant path option. Each 485 series includes two parallel path interconnects (RJ-45 or LC fiber) for primary/secondary operations. A typical scenario would have the local extender connected to the 485 unit with the primary connection to a KVM matrix switch and the secondary connection as a by-pass directly to the remote extender. In the event of a switch failure, the local and remote extenders can still communicate as a direct point-to-point path. The 485 Series family features bi-directional data ports allowing any port to be configured as an input or output. RCI Custom has announced upgrades to its proprietary design software Panel Builder SE, including project sharing, and the addition of a new category of parts and panels, the RCI Custom Value Line products. The new Share Function allows users to share design projects instantly via IP with other PB SE users for collaboration experience, and it makes design, approval, purchasing, and ordering faster and more efficient. The New Value Line parts category assembles in one place the most economical parts and panel offerings by RCI, when budget or competitive bid requirements dictate a value approach. Panel Builder SE (PB SE), the third generation design app developed by RCI Custom since 2002, allows users to create pro quality printable drawings, get instantaneous price quotes, and purchase online in an intuitive app that requires no CAD experience. The CKd Power Amplifiers combine the legendary overbuilt power supply design made famous by the Crest Audio Pro 200 with NexSys networking functionality and an ultra-lightweight class D topology. The design centers around an ultrahigh efficiency amplifier output circuit that reduces weight while increasing output power, reliability and thermal efficiency. The CKd Series offers four multi-channel models to meet the needs of demanding audio installations. The CKd 1208 and CKd 1204 provide 1,250 Watts per channel in eight and four channels, respectively, while the CKd 608 and CKd 604 provide 625 Watts per channel in eight and four channels. Each amplifier channel will operate to rated power in direct 70-volt, 100-volt, 8-ohm or 4-ohm modes, configurable per channel. CKd amplifiers are networkable through Crest Audio’s Nx Dante-8 and Nx Cobranet-8 NexSys control modules and either Crest Audio NexSys 5 or Peavey MediaMatrix NWare software programs for advanced control and audio routing. Riedel has enhanced its MediorNet family of real-time networks for video, audio, data, and communications with MediorNet 2.0, an update for MediorNet. At InfoComm 2014, the company will show how MediorNet 2.0 enables new video router functionality and high-speed rerouting, along with new WAN capabilities that include solutions for JPEG 2000 and H.264 formats.The MediorNet 2.0 update includes robust video router functionality with switching delays of less than 40 milliseconds, as well as high-speed rerouting that allows as many as 1,000 connections to be rerouted in less than a second. Simple drag-and-drop routing of multiple connections speeds configurations, and users now have the option to delete multiple selected connections at once. MediorNet 2.0 introduces Studer A-Link compatibility, which enables the MediorNet Modular frame to act as a decentralized audio router and fully redundant interfaces. At the same time, MediorNet fully supports EMB ER+ for integration with other common control systems, such as VSM and KSC Commander. Because the update permits access to all MediorNet parameters and allows users to edit I/O settings and control all routing functions, users retain control over configuration options. Additional features that come with MediorNet 2.0 include a timecode display that can be configured to the user’s preferred size and position, an LTC input, and sample rate conversion on both optical MADI ports of MediorNet Compact systems. The VM-4HN is a 1:4 HDMI distribution amplifier for HDMI signals. It relocks and equalizes the signal and distributes it to four identical outputs. The VM -4HN, with its maximum data rate of 10.2Gbps (3.4Gbps per graphic channel) distributes signals with resolutions up to Quad HD (38x40x2160), 24Hz refresh with 8-bit/10- bit/12-bit color, and 30 Hz refresh with 8-bit color. It also supports WUXGA (1920x1200) up to 12-bit color, and 1080p at all color bit depths. The VM-4HN supports Deep Color, x.v.Color, lip sync, HDMI uncompressed audio channels, Dolby TrueHD, DTS-HD, and CEC. It is HDCP compliant and features I-EDIDP ro Kramer Intelligent EDID Processing, an intelligent EDID handling and processing algorithm that ensures plug and play operation for HDMI systems. In addition, the default, pre-programmed EDID allows the VM-4HN to be connected quickly and without having to connect a display to the output. The VM- 4HN passes 3D. XMO S will demonstrate its new multicore microcontroller that delivers low cost daisy-chain ethernet AVB at InfoComm 2014. Daisy-chain-capable ethernet AVB reference design for the XMOS xCORE multicore microcontroller reduces AVB installation and equipment costs, enables conferencing and in-building audio/media ethernet solutions and supports automotive and industrial applications that require audio/media networking. XMOS AVB solutions are production-ready yet customizable, so designers can add system functions like clock management, audio signal processing, and custom control protocols. XMO S offers solutions for the full range of requirements, from very small low cost stereo endpoints to 40-channel pro-audio products. MediaMatrix is introducing a networked audio and control input/output node that supports both Dante and CobraNet audio transport protocols for efficient and convenient extension of audio and control inputs and outputs in networked systems. The F-DCM automatically determines which audio transport protocol is in use and negotiates its connection to the network accordingly via the same network connection and RJ45 jack. Rotary controls on the F-DCM front panel allow easy setting of the device address. The new F-DCM is a two-in/two-out network device designed for legislative chambers that can also be used in courtrooms and conference rooms. The F-DCM features two mic or line inputs on XLR or Euro connectors, each with 48V phantom power, and two line level outputs on Euro connectors. The F-DCM also provides extension of control via either Dante or CobraNet connections, including RS485 or RS232 serial control and two each of GPIO in and out. The F-DCM also provides remote control of the mic level, phantom power on/off, and input mute per channel. The F-DCM is housed in a compact and durable 18-gauge steel chassis that can be mounted easily under tables, in millwork or in equipment racks or housings. The F-DCM features an internal universal power supply, which connects via an IEC connector in the rear panel. Blonder Tongue’s AQT8 Series transcoder provides channel processing in a high-density, low-cost, flexible 1-RU chassis that reduces the equipment, space, and power needed for QAM or IP TV in-house distribution. The AQT8 Series transcoder inputs eight 8VSB digital off-air and/or QAM signals, and outputs both in IP and QAM simultaneously, providing operators with maximum flexibility for selecting channels and distributing them. Through an interactive dashboard, operators can monitor the performance status of all eight channels. An intuitive web-based GUI simplifies setup and management, enabling local and remote operation. Three models are available depending on the desired output distribution. The AQT8-IP provides an IP output, the AQT8-QAM provides a QAM output, and the AQT8-QAM/IP provides QAM and IP outputs simultaneously. Emergency alert system (EAS) program switching is featured on the GigE output, triggering either an ASI or IP format EAS input and terminal block contacts, allowing operators to comply with EAS requirements. Marshall Electronics is releasing the VS-104-3GSDI 1080p/59.94 full HD IP video encoder/decoder with a maximum frame rate of 60fps at 1920x1080. The VS-104-3GSDI simplifies the delivery of high definition video and embedded audio via an IP network. Marshall’s VS- 104-3GSDI encoder/decoder is a high definition video server that allows real-time transmission of video and embedded audio over standard IP networks and the internet. The VS-104-3GSDI has a configurable inputs and outputs: CVBS, HDMI, SDI, HDSDI, and 3GSDI. Unicast, multicast, push, and pull streaming are supported and controlled from a common, easy-to-use browser interface now featuring 4:2:2 color space. Advanced features of the VS-104-3GSDI include PO E+ and multiple programming interfaces, and it is compliant with the ONVIF Standard. The Marshall VS-104-3GSDI offers quad streaming of H.264 and / or MJPEG. Embedded audio is supported in 3GSDI, HDSDI, SDI, and HDMI. Stereo analog is also provided. Draper has introduced a new interactive “whiteboard” screen to be demonstrated at Info- Comm 2014. Draper’s Scribe Interactive Screen is a rigid front projection screen for use with ultra-short throw projectors. The strong protective coating allows you to write directly onto the screen with a dry erase marker. The Scribe Interactive Screen’s protective coating is designed to reflect less light than is typically seen with so–called “whiteboard” screens, so projected content isn’t washed out in bright classrooms and meeting rooms. The coating wipes clean easily with an eraser. In addition, the Scribe comes with a low profile frame, and is magnetic as standard—not an add-on. Pakedge Device & Software has announced that, effective immediately, its K6x routers have reached end of life (EOL ) status and will be replaced with the K60D series, based on the K60D enterprise-class router. The new kits provide increased internal networking speed, throughput, and boast a session-count of up to 500,000 simultaneous sessions— allowing an unprecedented number of applications to run on a network. Pakedge will continue to provide lifetime technical support for legacy K6x router kits. K6x units requiring replacement service during the warranty period will be replaced with the corresponding K60Dx unit. Pakedge technical support is available for those moving to the K60Dx routers, including assistance with updating previous router configuration files. The expanded range of K60D router kits feature Pakedge’s top-of-the- line switch technology, designed specifically for the demands that AV applications place on networks. With features including preconfigured VLANs enabling the easy setup of broadcast or latency-sensitive devices that require their own segmented sub-network for best performance, Pakedge TruStream technology to ensure latency-sensitive traffic prioritization, and options including a full line of PoE and PoE+ capable switches to power the ever-growing range of PoE-enabled devices, such as wireless access points, touchpanels, and IP security cameras. The range offers installers nine router and switch combinations for all types of network configurations, or the K60D can be purchased as a standalone router. Matrox Avio F125 fiber-optic KVM extenders separate dual HD or single 4K ultra HD video, keyboard, mouse, stereo analog audio and USB 2.0 devices from a computer, providing real-time control of high-performance workstations located up to six miles away. The transmitter/receiver pair extends two single- link DVI (2x1920x1200) or one dual-link DVI (2560x1600 or 4096x2160) video, and multiple high-speed USB 2.0 compliant devices from the host computer by up to 1,312 ft (400 m) over multimode cable and 6.2 mi (10 km) over single-mode cable. Avio F125 stands out for its ability to transmit all signals with zero compression and zero latency on a single duplex LC-LC fiber-optic cable. AC-424 USB boundary web conferencing microphone from MXL Microphones has the same three-capsule design of MXL’s best selling AC-404 boundary microphone, but it features a new body style. The MXL AC-424 is similar to the AC-404 but with enhanced features, like a mute button, adjustable sensitivity switch, and a headphone out. Users can adjust the sensitivity switch to suit the size of the room. It has three capsules for a 180-degree pickup range to capture people speaking around a conference room. The AC-424 has a new, contoured body style. It connects to a computer via a USB cable with mini plug. MXL’s new AC Series microphones offer professionals the ability to speak clearly and naturally with associates over the internet. The StarlingTension Series from Elite Screens features an enhanced aluminum casing with floating installation brackets for added versatility in an installation. Its stylish arcuate profile was designed to enhance the flow of interior décor. It uses Elite’s 1.1 gain Spectra White FG material with a quiet and power saving synchronous motor. The Starling electric projection screen ships fully assembled with integrated control buttons on the end-cap in addition to a complete set of infrared and radio frequency remotes, a 12-volt trigger and RS232 port. The StarlingTension is available in a range of sizes, including 100 inches, 120 inches, 135 inches, and 150 inches in a 16:9 HDTV format through the CE retail channel. The team at Elite Screens introduced the StarlingTension to take the original Starling product to the next step with an enhanced option. Dan Dugan Sound Design has released the Dugan Model E-2 automatic mixing controller for use with multiple live microphones. Incorporating eight channels with Dugan Music System and Dugan Gain Limiting (analog I/O), 12 channels Dugan Speech System (analog I/O) or 16 channels Dugan Speech System (ADAT digital), this product replaces the Dugan Model D-2 as the company’s top-of-the- line automatic mixing controller with analog I/O. It may be operated from the Dugan Control Panel for Java (included in the purchase price), the Dugan iPad app that provides the Dugan panel on portable devices, the Model CP-2 physical control panel, or the front panel mute and bypass buttons. The Model E-2 links with all other digital Dugans to form larger systems. Analog audio connections are made through a DB -25 connector; readily available cable squids can be used where XLR connectors are desired. I/O may also be switched to ADAT optical connectors, as in Dugan’s other E-series controllers. The Visionary Solutions, Inc. (VSI) PackeTV IP video network and asset management solution is a modular, end-to-end video network and asset management solution that enables secure, scheduled, and on-demand delivery of live and recorded video, with support for multiple screens and networks. Through PackeTV, organizations can deliver high-quality HD and SD, MP EG- 2/H.264 video content to TVs, set-top boxes (STBs), PCs, tablets, smartphones, and other IP -connected devices across a wide range of networks, including LAN, WAN, Wi-Fi, cellular, and public internet. PackeTV supports a variety of applications from corporate communication to video monitoring, training, and distance learning to legacy cable system replacement with TV over IP . The open-standard solution is compatible with a wide range of equipment, including VSI encoders and decoders, and features the same modular architecture as the encoder and decoder product lines, allowing customers to upgrade as their budget permits. Through an intuitive, web-based user interface, administrators can create and manage video assets for distribution across any type of network. Video assets are fully protected via AES 256/128-bit encryption, and access can be controlled right down to the individual user and group level through integration with Microsoft Active Directory. Extreme Networks will demonstrate and showcase at InfoComm its Summit X440, Summit X460, and Summit X670 top-of-rack Ethernet switches. These connectivity devices support AVB, providing Gigabit ethernet, 10Gigabit ethernet, and 40Gigabit ethernet connectivity to the AV endpoints that are part of the AVNU Alliance, delivering an inclusive solution that spans the converged edge to the enterprise core and beyond. Extreme Networks delivers high-performance switching and routing products for data center and core-to-edge networks, wired/wireless LAN access, and unified network management and control. The solutions include software-defined networking (SDN ), cloud and high-density Wi-Fi, BYOD , and enterprise mobility, identity access management, and security. Platinum Tools will showcase the new 10Gig Termination Kit (P/N 90170) at InfoComm 2014. The new system, which exceeds 10Gig performance standard requirements for streaming high bandwidth across Cat-6E, Cat-6A, and Cat-7 cable, is now shipping with an MSRP of $240.00. The 10Gig Termination turnkey field kit includes Cat-6A shielded connectors, the Tele-TitanXg Cat-6A crimp tool, cable jacket stripper, and external ground tab crimper. Crimson AV’s new CM Series of menu board multi-monitor mounts offers is designed to reduce installer assembly, installation, and alignment time for inline multiple-display arrays and menu board installations. The CM Series is a fully modular solution that allows installers to quickly mount multiple displays from the ceiling in either landscape or portrait orientation with minimal ceiling drops to distract the intended audience. To simplify the specification and ordering process, CM Series prices are based on the number of displays to be mounted. Systems designers only need to know the size and number of displays and their proposed orientation. Crimson will kit the complete mount system for the installer and ship it to location in cartons that can be easily managed onsite by a single installer. Other installer-friendly features include Crimson’s simplified alignment design and post-installation leveling. Boeckeler Instruments launches the Pointmaker CPN -5600 HDCP annotation system with iPad control. The professional hardware-based video processor is designed so that users can display or share content from an iPad, as well as from multiple video and computer sources. This new model has a much smaller footprint and faster processing speed than previous models, and it includes the ability to change settings, switch video sources, and annotate from the convenience of an iPad. Boeckeler priced this model the same as the CPN -5000 for now, but gave it many new features besides iPad control, including upgraded menus, additional HDMI ports, faster saving of images to USB, and, of course, the smaller footprint. The addition of offset rack ears for the 11.875-inches wide unit are provided free when specified at the time of order. This set-up allows for front-end USB cabling and gives extra space on the side of the unit to house a power supply.